HOW FEAR CAME The stream is shrunk—the pool is dry,And we be comrades, thou and I;With fevered jowl and dusty flankEach jostling each along the bank;And by one drouthy fear made still,Forgoing thought of quest or kill.Now 'neath his dam the fawn may see,The lean Pack-wolf as cowed as he,And the tall buck, unflinching, noteThe fangs that tore his father's throat.The pools are shrunk—the streams are dry,And we be playmates, thou and I,Till yonder cloud—Good Hunting!—looseThe rain that breaks our Water Truce. 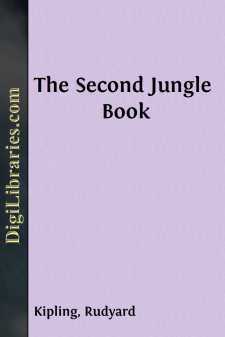 The Law of the Jungle—which is by far the oldest law in the world—has arranged for almost every kind of accident that may befall the Jungle People, till now its code is as perfect as time and custom can make it. You will remember that Mowgli spent a great part of his life in the Seeonee Wolf-Pack, learning the Law from Baloo, the Brown Bear; and it was Baloo who told him, when the boy grew impatient at the constant orders, that the Law was like the Giant Creeper, because it dropped across every one's back and no one could escape. "When thou hast lived as long as I have, Little Brother, thou wilt see how all the Jungle obeys at least one Law. And that will be no pleasant sight," said Baloo. This talk went in at one ear and out at the other, for a boy who spends his life eating and sleeping does not worry about anything till it actually stares him in the face. But, one year, Baloo's words came true, and Mowgli saw all the Jungle working under the Law. It began when the winter Rains failed almost entirely, and Ikki, the Porcupine, meeting Mowgli in a bamboo-thicket, told him that the wild yams were drying up. Now everybody knows that Ikki is ridiculously fastidious in his choice of food, and will eat nothing but the very best and ripest. So Mowgli laughed and said, "What is that to me?" "Not much NOW," said Ikki, rattling his quills in a stiff, uncomfortable way, "but later we shall see. Is there any more diving into the deep rock-pool below the Bee-Rocks, Little Brother?" "No. The foolish water is going all away, and I do not wish to break my head," said Mowgli, who, in those days, was quite sure that he knew as much as any five of the Jungle People put together. "That is thy loss. A small crack might let in some wisdom." Ikki ducked quickly to prevent Mowgli from pulling his nose-bristles, and Mowgli told Baloo what Ikki had said. Baloo looked very grave, and mumbled half to himself: "If I were alone I would change my hunting-grounds now, before the others began to think. And yet—hunting among strangers ends in fighting; and they might hurt the Man-cub. We must wait and see how the mohwa blooms."